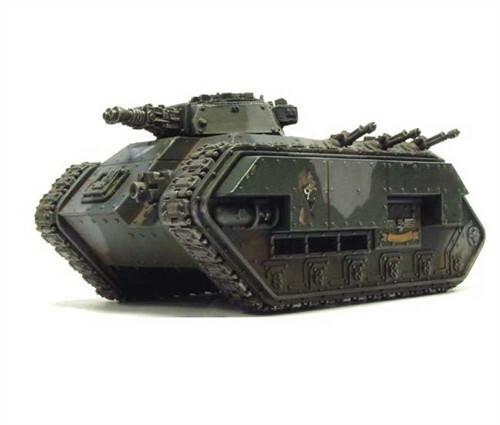 The primary duty of the Chimera is to accompany tanks into battle and provide protection for the Guardsmen within so that they may support the tanks. Standard doctrine states that after the Chimera reaches its objective it lays down covering fire with its heavy weapons while the squad within disembarks and advances. The Chimera then falls back to a firing position from which it can still support the infantry and await orders to race forward and collect the squad again to reposition them. [3a] When operating as part of an armoured advanced the Chimera often operate ahead of or on the flanks, as well as side-by-side with the Leman Russ Battle Tanks, providing additional weight to the tanks' massed firepower. Besides the added mobility, firepower and protection, Chimeras allow infantry to take extra gear, including med-kits, vox equipment and more ammunition, making them far more efficient than their foot-slogging infantry. [3a] The Chimera is less useful though when forced to fight in urban settings or as part of static defenses. The Chimera can fulfill additional roles and many basic variants of the standard vehicle exist. With their communication equipment and scanners Chimeras are suitable command vehicles, while those with Dozer Blades can clear terrain for heavier vehicles to move through or provide nighttime illumination from their Searchlights. [2a] While generally armed with a Multi-laser and Heavy Bolter, those fitted with a Heavy Flamer are popular when fighting in dense terrain such as jungles and forests; usually one in three Chimeras will be outfitted as a flame tank if other infantry close support vehicles, such as Demolishers, Thunderers and Hellhounds, are unavailable. Those equipped with Autocannons also fulfill the light anti-vehicle role, while Gryphonne IV makes a unique Chimera variant mounting twin-linked Heavy Bolters, particularly effective against dense infantry formations such as Ork mobs and Tyranid swarms. [3a] Chimeras have also been used by the Inquisition to transport Inquisitors and their stormtroopers, Purity Seals affixed to the hulls to protect the vehicles' machine spirit and its passengers from daemonic possession. Gryphonne IV pattern - Armed with turret-mounted Autocannon or twin-linked Heavy Bolters. A Chimera in the service of Inquisitorial Stormtroopers. Storm Chimera - A configuration issued to specalised units of the Death Korps of Krieg for frontline assaults. Modified with additional extensive abalitive armour and primarily armed with an Autocannon.